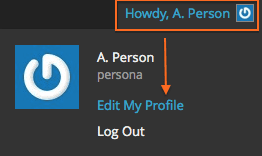 One of the first things you should do is customize your site by setting options in your personal profile. …or click on Users > Your Profile. This will take you directly to Your Profile. Visual Editor – Gives you a WYSIWYG editor in addition to an HTML editor. Leave this turned on unless you only want to use the HTML editor. Admin Color Scheme – WordPress 3.8 introduced several new color schemes. Select one that suits your preferences. You can toggle through the choices and get a preview before saving. Keyboard Shortcuts – Allows you to use keyboard shortcuts to moderate comments. Click if you want to learn more. Toolbar – You can turn off the Admin toolbar when viewing your site. This is the black toolbar that is viewable from both the Dashboard and the public view of the site when logged in. All of the fields in this section are taken directly from the campus phonebook when you created your site. By default, your Display Name will be your First, Middle and Last Name as it appears in the campus phonebook. This will be your byline for your stories so take a moment to set this the way you want it to look. To change your Display Name, select one of the options in the Display name publicly as drop-down menu. We recommend changing your Nickname and then selecting that as your display name. E-mail – You must have an email address listed and it must be an @uci.edu address. Website – You may list a personal website that is related to your site. AIM, Yahoo IM, Jabber / Google Talk – You may list your AIM, Yahoo or Jabber/Google Talk chat addresses. You may enter any biographical information about yourself or your site that you want to share. If you made any changes, click Update Profile at the bottom of the page to save your updates.